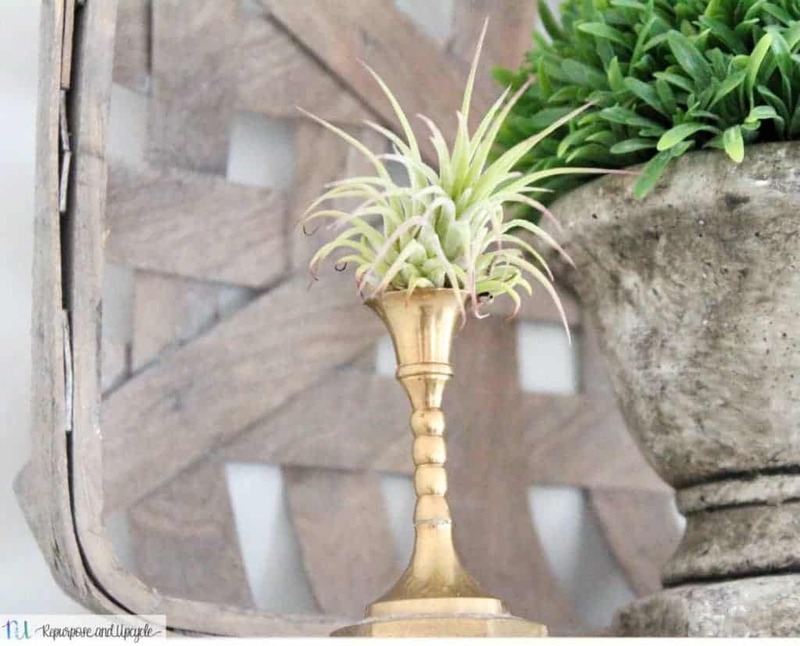 What are Air Plants and How do you Decorate with Them? If you had asked me six months ago what an air plant was I would have looked at you like you had six eyes. Let’s just say I have a bit of a black thumb. Can anyone else relate? This interest in air plants started a few months ago while I was at the local hardware store with my four year old. She was “beebopping” around like she normally does while I’m trying to make sure she doesn’t break anything. In her normal fashion, she was jumping around the garden area, her favorite spot. She stopped to touch all the “sticky” (cactus) plants. As I was about to redirect her attention to the exit sign, a nice lady approached me. She asked if I knew anything about “air plants.” Of course, I said no. She then spent a quick five minutes explaining all about them. In all of her explantation, I heard a few quick points; “they don’t have to live in soil and you only have to “mist” them once a week.” Let’s just say I was intrigued. This is where my interest in air plants started. Y’all are also in for a treat today because I’ve joined a fabulous group of ladies with other spring inspired DIY’s. A big thank you to Jen at the blog Noting Grace for putting this all together. 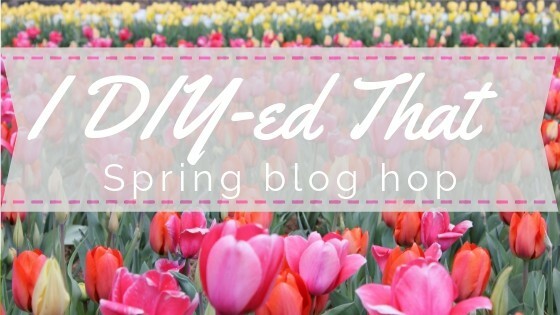 Make sure you check out the end of the post with all sorts of spring inspiration! 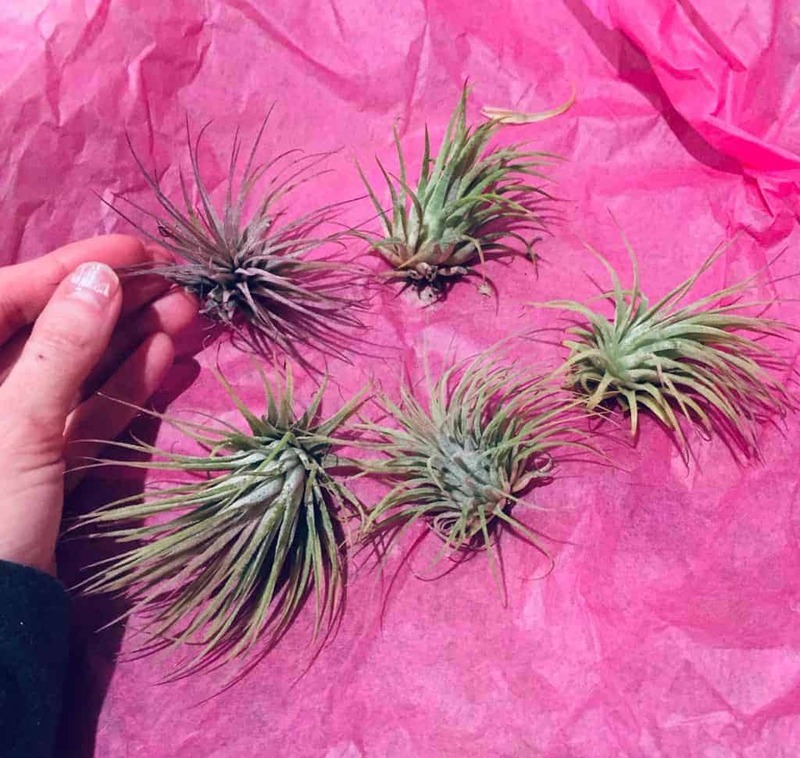 There are TONS of different types and varieties of air plants. I’m going to be sharing a few of the most popular varieties. Because they don’t thrive in water or soil, these types of plants have become super popular over the past few years because they are so easy to care for. Let’s be honest, it’s the main reason I’m interested in them! How do you care for air plants? Air plants require bright, indirect light either as sunlight or consistent indoor home lighting. This is another reason why they are so great for indoor plants! It’s suggested that you only have to submerge or heavily mist your plants in water for 20-30 minutes once a week. No daily watering! It’s best to gently shake out the excess water and lay them out to dry before displaying. 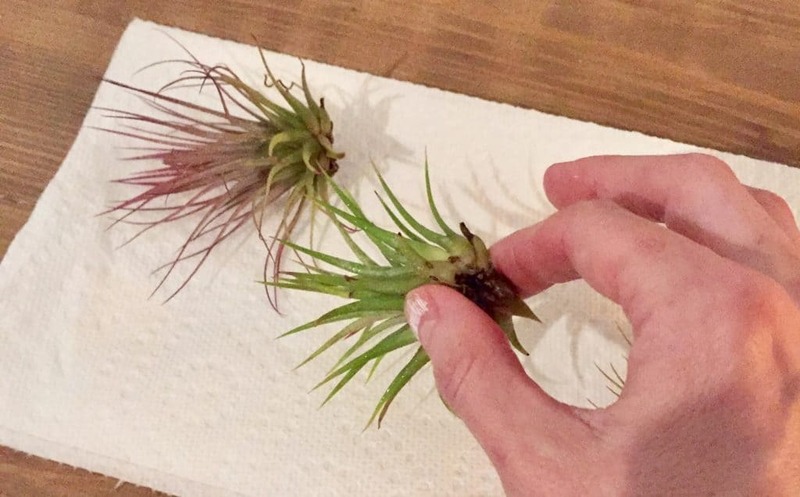 Note: don’t let air plants remain wet for long periods of time. Disclosure: this post contains affiliate links. If you purchase from one of these links I will receive a small commission, but rest assured you won’t pay anymore for the product. Thank you for supporting my blog. Where do you buy air plants? 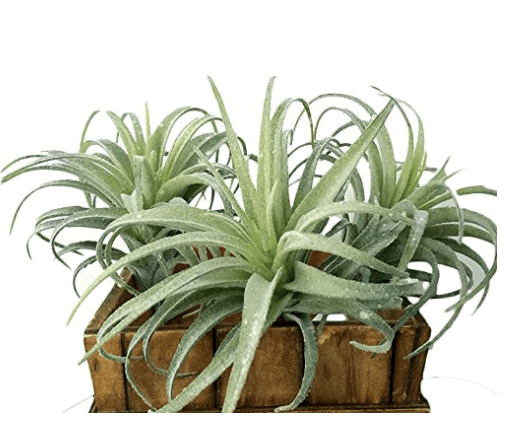 Are you looking for faux air plants? I found a great supply of faux air plants at Hobby Lobby. You can see how I decorated them in my new office space below. 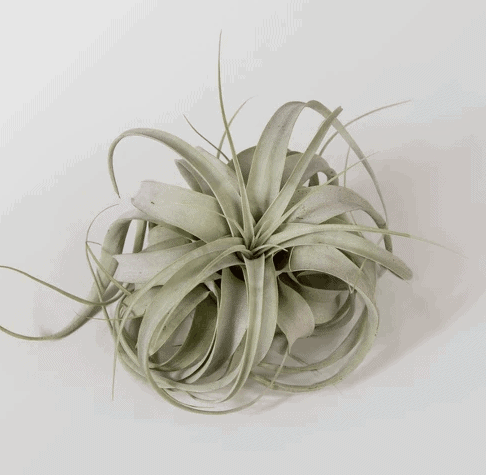 This particular air plant is called the Tillandsia Xerographica. You can see a set of faux air pants from Amazon below. These are also the Tillandsia Xerographica plants. Want to see the assortment of air plants from Target? Take a look at one below. You can also purchase them at your local hardware store, if they have some in stock. I tried to find some at Home Depot, but they were out. You can also order them online. Here are some from Home Depot’s website in an assortment of types. I purchased a set of real air plants from Amazon. They came in a brown box wrapped in pink tissue paper. 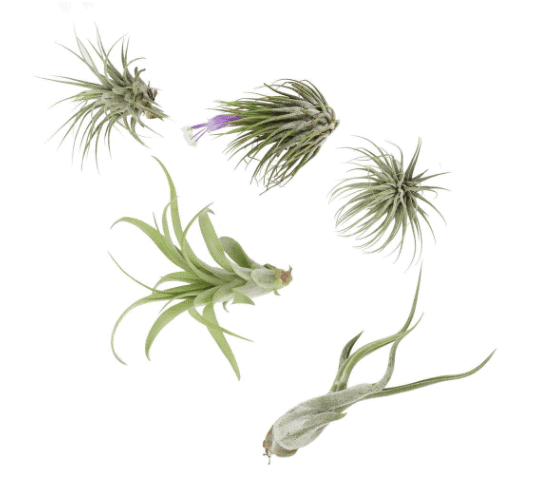 This set of plants are called Tillandsia Ionantha house plants. 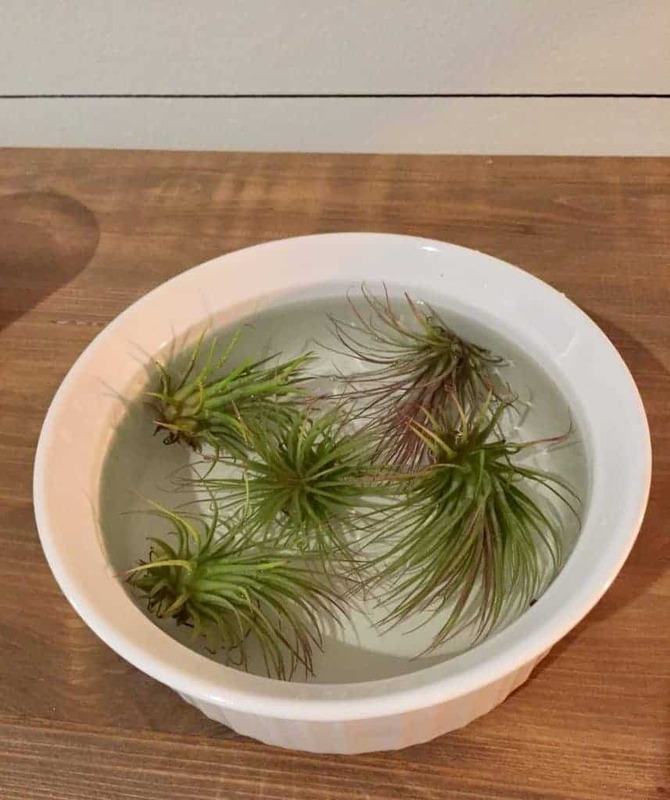 After I removed my air plants from the pink paper, I put them in a small bowl and let them sit for 20 minutes. I then removed them from the bowl, slightly shook the excess water off, and laid them on a paper towel to dry. Now it’s time to decorate with my new air plants! 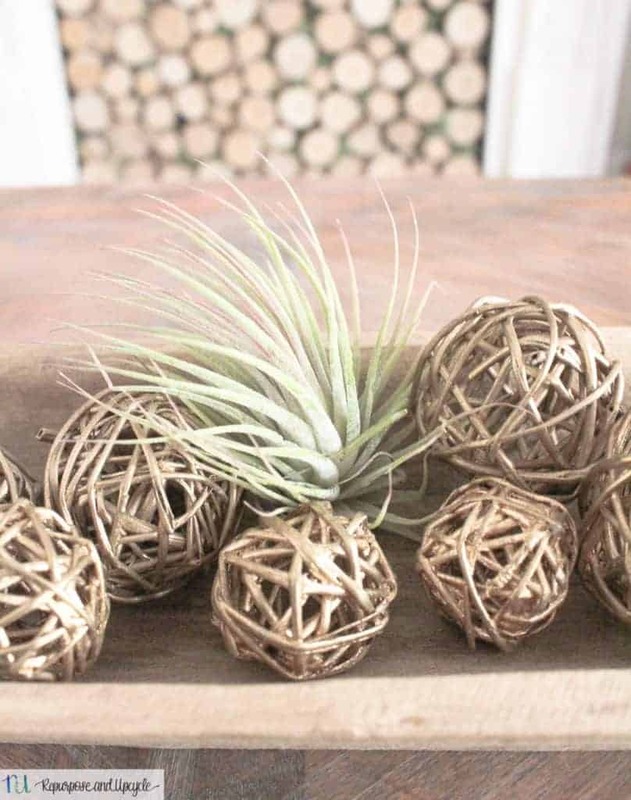 How do you decorate or display an air plant? 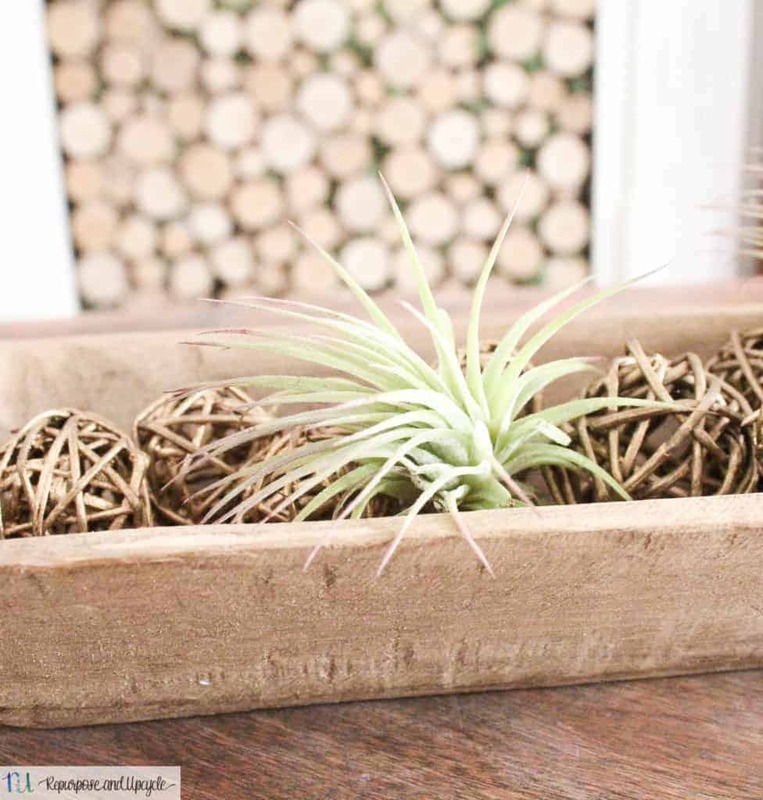 Air plants are mostly seen displayed in jars, terrariums, and things like driftwood! Don’t put them in soil. This is the fun part. 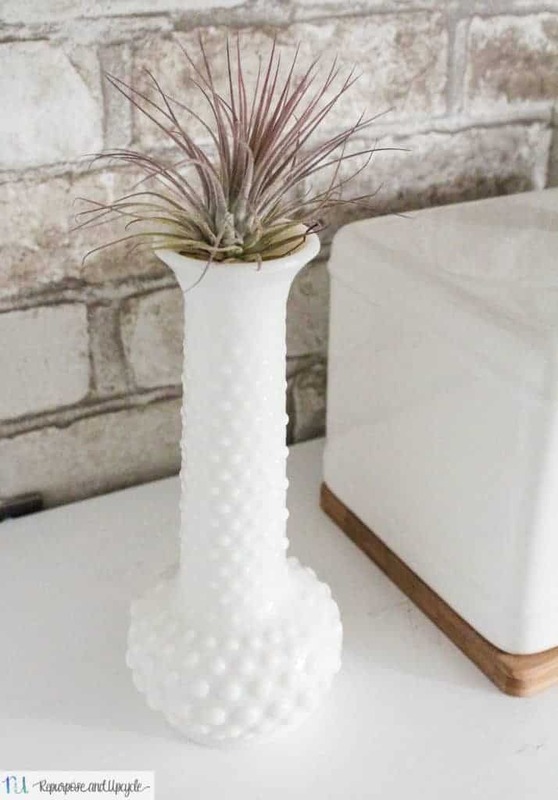 I’ll share a few of my own air plant decor ideas with a few others too. Driftwood and other natural elements like birch wood are a great way to display your air plants. 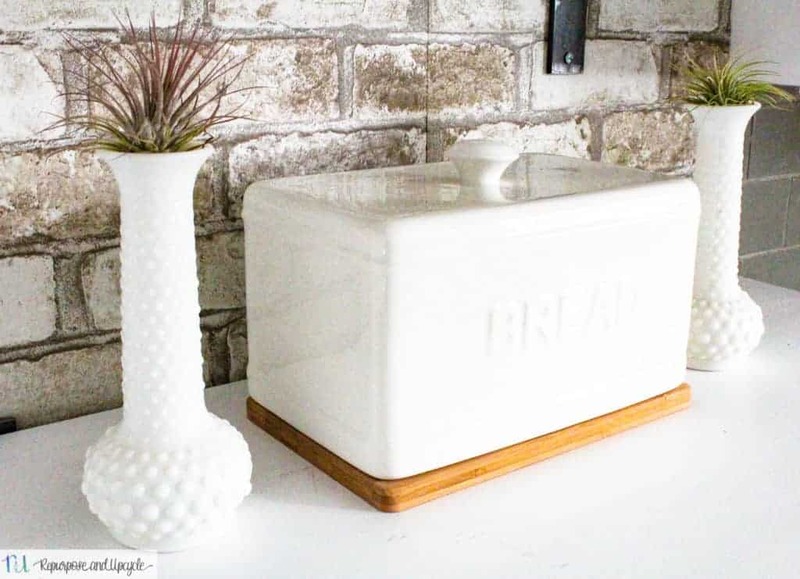 Bread bowls and other household or decorative bowls are a great way to style and display them. They add just the right amount of green. I’ve used my air plants to add just a little color to my kitchen. The green helps break up all the white with the milk glass and the bread box. 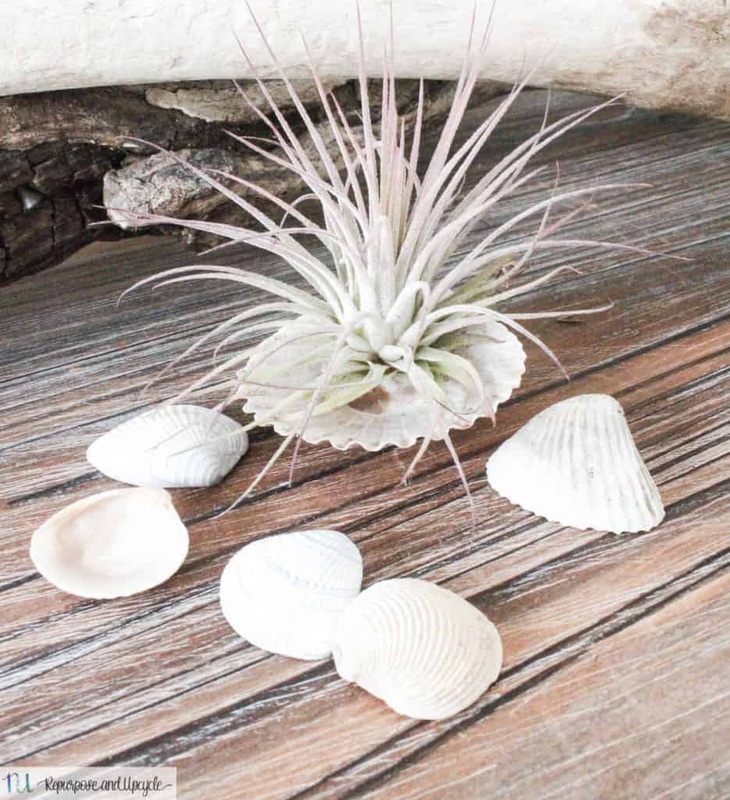 Another way to decorate with air plants is to place them in similar size seashells. 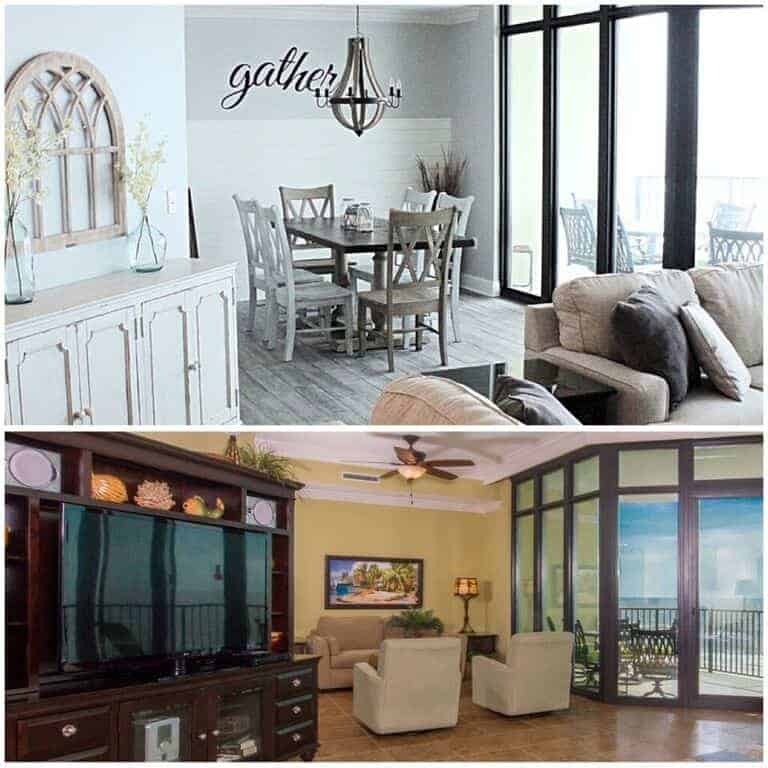 This adds a fun “coastal” vibe. Place air plants on top of candle holders instead of using candles. A great way to repurpose a candle holder with a touch of green. 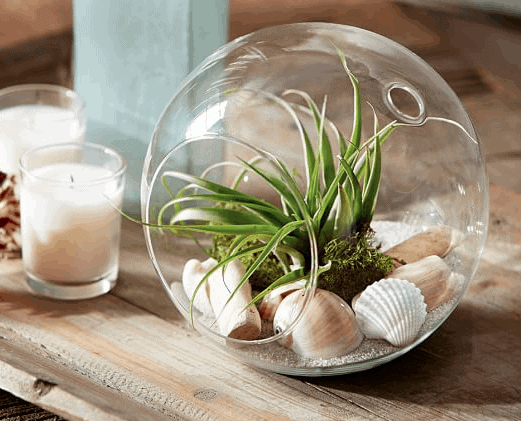 There are so many affordable ways to buy terrarium’s with air plants like the one I found from Pottery Barn below. 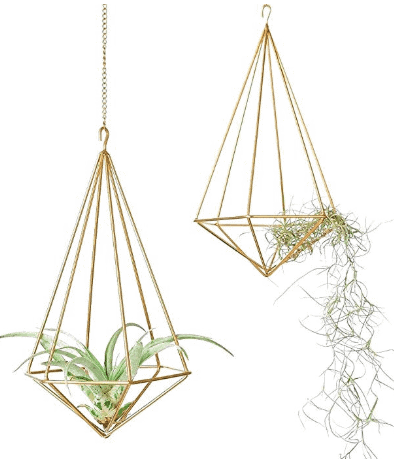 Set your air plants in hanging holders like the ones I found below from Amazon. I hope I’ve given you a few ideas on how to decorate with air plants. If you enjoyed this post I would love for you to pin the image below to Pinterest! Now it’s time for some spring I DIYed that inspiration. Head on over to Alicia at Thrifty and Chic to learn more about her fun DIY. I have always wondered about air plants but was scared to try them. This is so helpful! Thank you for sharing these tips and thanks for joining us this week! I always love seeing what you share! I love how you’ve added them into your decor Lindsey! 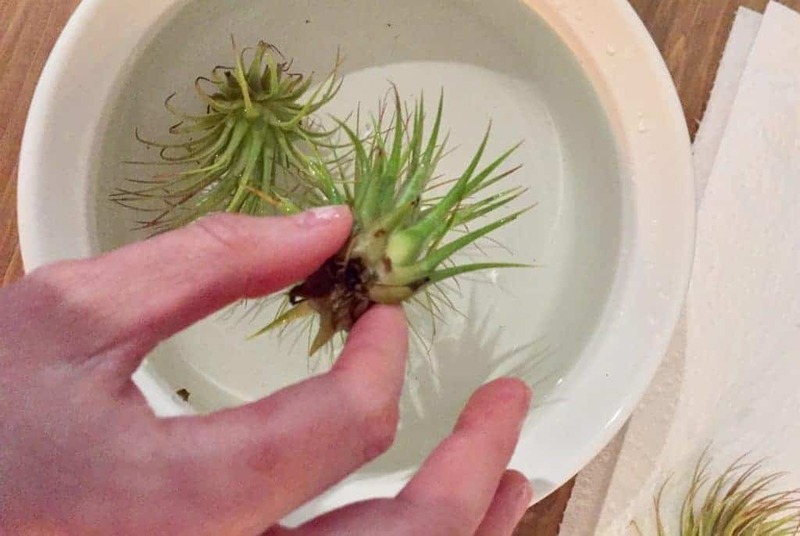 I’m going to have to try out some of your tips because I was never sure how to care for air plants either! Thanks for all this information on air plants since I never had a clue on how to care for them. I especially love the hanging holders! It’s also great meeting you through Jen’s blog hop. I’m glad you learned something! Great meeting you too! Oh my goodness. These air plants are so cute! 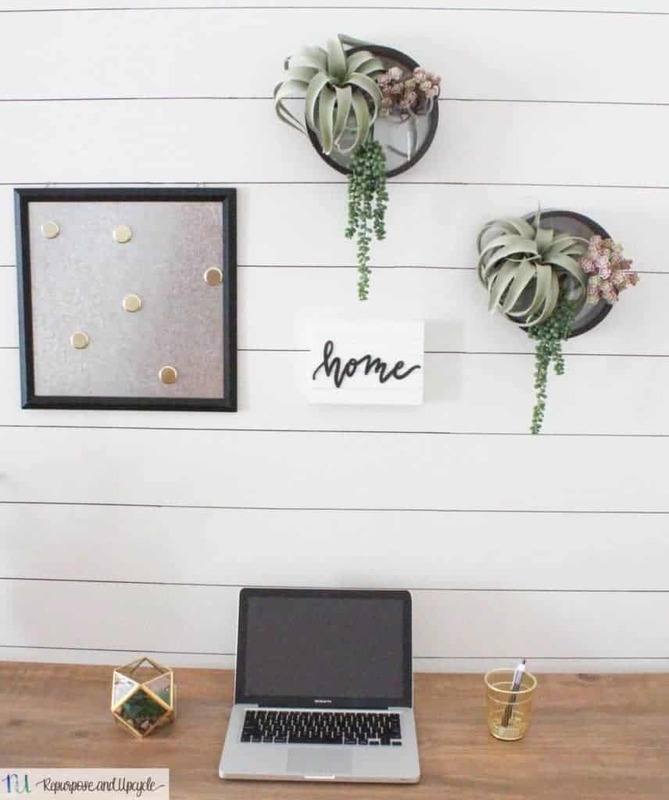 I’ve been wanting to add some to my home so I am so glad you did this post! Like you, I had no idea about air plants. Fascinating! Thank you for sharing. 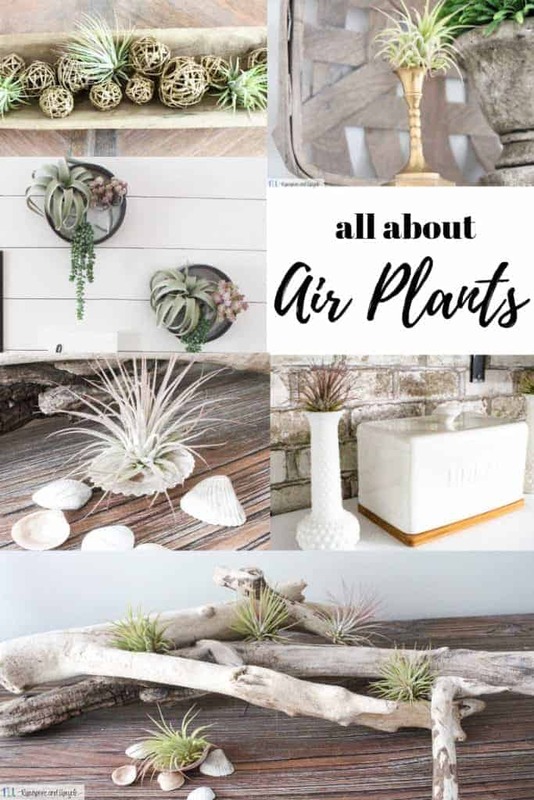 A lot of informations about air plants. I like all your decorations, are very lovely. Thank you for idea. This is so cool! I think I need some. I had heard of air plants, but I think the places you’ve used them are just amazing! Love this. Your tips and tricks on decorating with air plants are wonderful! Oh wow. Am I the only one who didn’t know you could order these from Amazon?! I bought some vintage sugar molds that are perfect for these so can’t wait to order some. Featuring when my link party opens!